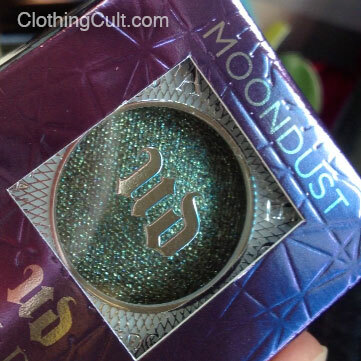 Urban Decay Moondust Eyeshadow in Zodiac is a very complex neutral shade. In daylight the swatch looks more subtle but in artificial light the shimmer really pops. I couldn’t really capture this with photos so I decided to swatch it on my hand and do a video. It was a wet application of the eyeshadow in the video. When applied dry it’s much lighter and can be used more subtly. I have included below some photos of both wet and dry applications on my eyes both in natural light as well as in my bathroom. (Nitpicking my up close photos – I don’t think anyone should ever be this close to my eyebrows but in the photos you get to see that I need to clean them up a little. Also a few photos it somehow looks like my eyeliner isn’t applied all the way down even though it is.) In photos: Everyday Minerals powder foundation, Mica Beauty liquid liner, Covergirl Waterproof mascara in black. That’s it. No other eyeshadows applied.